Is this a clearisil ad? It’s for a vacuum-pump style blackhead remover, yeah. So sort of a mechanical Clearasil before there was Clearasil. Either she’s a little on the picky side (this is the only thing keeping her from marrying him?) 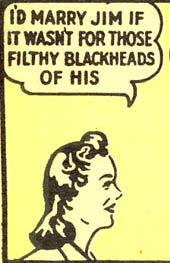 or those blackheads are enormous (entirely possible! ).